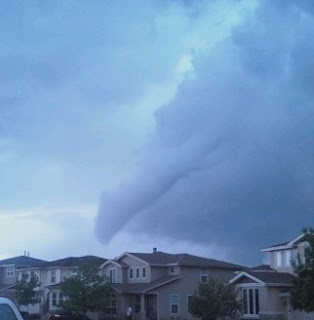 Whew - close call with that funnel cloud! Sounds like you had a productive weekend. Furniture & painting is a workout too, you know! Yikes! What a crazy piece of weather! I bet you've got some nice arms after all that painting...It is definitely a workout! First - get some super sliders for the furniture. Makes even giganto furniture easy to move. Second - I have a bathroom that's half painted and several bottles of wine. You come paint and I'll keep an eye to the skies, just to be careful. Don't mix that with wine, sister! Especially if you intend to operate heavy machinery. I remember when Ian was 5 and always wanted to help with painting, etc. It's funny now. At the time I took refuge in beer, which is basically wine with the estrogen removed and testosterone added. Oooh, that sounds scary (the funnel). Oh, and I love my foam roller, most of the time, mmm maybe some of the time, well I don't know...it likes to cause pain. Other than that, it's awesome!